At a city-sponsored meeting on litter abatement, attendees were asked to come up with a headline about litter they one day wished to see. Community activist Justin Rudd's headline read: "Monthly Beach Cleanup Canceled -- No trash." "That's my dream," he said. For more than 19 years, Rudd has organized a monthly cleanup of the beach around Granada Avenue. The result has been thousands of bags of debris removed from the area and thousands of people mobilizing to help. RUDD'S EFFORTS HAVE NOT GONE UNNOTICED. Keep California Beautiful, a nonprofit, state-sanctioned environmental steward program, bestowed on Rudd its Hal Albertson Volunteer of the Year award for his efforts with 30-Minute Beach Cleanup. "There are a lot of people who go out once or twice a year to clean up our beaches and that's great. I don't know what we would do without them," Keep California Beautiful Executive Director Marlene Mariani said. "But Justin has taken it the extra mile." SOON AFTER RUDD moved to Long Beach from his home state of Alabama, he began noticing the sad state of the city's beaches and wanted to do something about it. A personal trainer who offered workouts on the beach, Rudd one day asked everyone to help him clean up. "I told everyone, why don't we stay and clean up? We use this beach why don't we be good stewards?" Rudd recalled. "There were maybe 10 people. Then I said we should do this every month." WANTING TO MAKE IT EASY for people to attend, Rudd decided to keep the cleanups short -- only a half an hour. He asked his friends to bring people they knew and put up fliers around town. He also asked the city to donate bags and gloves and businesses to donate refreshments. "What works for us in this 30-minute beach cleanup is the partnerships that have come through," Rudd said. "Justin Rudd isn't the only one out there cleaning the beach. It's 100 people out there. Unless you have partnerships, it's not going to be successful." Rudd is excited about the being named volunteer of the year, but is humble about it. "It's truly an honor," he said. "California has got to be the most environmentally friendly state in the country and to be chosen for a statewide honor, that's pretty cool." KEEP CALIFORNIA BEAUTIFUL aims to create a litter-free California by encouraging business, government and public partnerships in cleanups and other beautification efforts. It was the administrators of Long Beach Beautiful, the city's Environmental Services Bureau, who nominated Rudd's 30-Minute Beach Cleanup for an award. Rather than recognizing the program, KCB decided to recognize its founder. "We just thought what a great idea, a 30-minute beach cleanup, anyone can do that," Mariani said. "It's fantastic that he thought that up. It speaks to how committed he is." cleanup.org, and his extensive public relations campaign. "It's just on and on and on. It's just truly amazing that someone would care that much to do that for the community," Mariani said. "Long Beach is very lucky to have him." roadway cleanup in Placer County for nearly 20 years. He passed away in late 2004.
selection of Rudd this year was apropos. "It seems that Justin Rudd was cut out of the same mold as Hal. It's nice to see a young man really committed to cleaning up his neighborhood." RIGHT NOW, while the need is in your mind, won't you please donate? WE HOPE YOU share our love for animals, kids and the environment, and our wish is that you'll consider a gift of $25, $50, $100 or another amount so that we can continue to bring you clean and safe beaches. CHECKS to BEACH CLEANUP, Attn. Justin Rudd, 275 St. Joseph Ave., Long Beach, CA 90803. NEXT CLEANUP: Saturday, April 20, 10 a.m. -- our 238th consecutive month. Free beachfront parking when you use the code JR0420. The new code is also available each month on our Facebook page. REFRESHMENTS PROVIDED by Duthie Power Services (sodas and water), Dogfellaz (ice) and Corner Bakery (lemonade and cookies)! 2019 CLEANUP SPONSORS: Duthie Power Services, Corner Bakery, Dogfellaz, Spas for Paws. Groups and individuals of all ages are invited to participate and support this monthly environmental clean-up effort. Additionally, students will receive a one-hour volunteer service credit for their participation if they arrive at 9:35 a.m., and Scouts can receive credit toward merit badges. Also, any person in need of completing community service is invited to help out and receive service credit. On-site refreshments provided by Duthie Power Services and Corner Bakery! The 30-Minute Beach Cleanups are held rain or shine on the third Saturday of each month at 10 a.m. at 1 Granada Ave. since June 1999. At the cleanups, organizers provide free giveaways, trash bags, gloves, refreshments from Duthie Power Services and Corner Bakery, and volunteer service verification forms. An average of approx. 100 volunteers participate each month, and all ages and all sizes of groups are welcome. No RSVP is needed. Dogs are welcome off-leash at Rosie's Dog Beach during the cleanup. Every 3rd Saturday of each month at 10 a.m. at 1 Granada Ave. The half–hour beach cleanup takes place at 1 Granada Ave. on the third Saturday of every month and approx. 150 volunteers of all ages show up to help. The 30-Minute Beach Cleanup seeks to create a clean and safe place for residents, visitors and aquatic wildlife along the Long Beach coast. During the effort, volunteers progress toward the Belmont Pier and the Peninsula. Volunteers are asked to wear shoes and sunscreen. No reservation is necessary, and large and small groups are welcome. Bags and gloves are provided. Students will receive volunteer recognition forms so they can report service hours. The 30-Minute Beach Cleanup which began in June of 1999 is organized by Justin Rudd and his 501c3 nonprofit Community Action Team (CAT). Also, will you click this link to sign-up for (another) one of Justin Rudd's: e-Newsletters? Be sure to be signed-in by 10 a.m. sharp to get a raffle ticket to win some great door prizes each month. The drawings are held approx. 10:35, after the half-hour cleaning. Be signed-in before 10 a.m. sharp AND get a hand stamp from the registration tent. We will sign your volunteer form or we'll provide a form for you at the end of the cleanup. 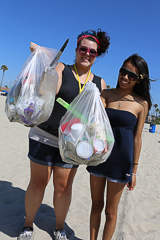 g Calif. Coastal Cleanup Day, THIRD Saturday in Sept., 9 a.m. to noon. about upcoming beach cleanups in the Greater Long Beach area. Justin Rudd will send you a reminder just before each monthly 30-Minute Beach Cleanup. CLICK HERE to subscribe. More than 3,900 subscribers! LET YOUR VOICE be heard now. CLICK HERE to e-mail Long Beach officials about your beach concerns that might include the amount of trash on our beaches. Also, write letters to the editor. Keep the issue alive in the media by using this easy, free channel to educate the community! VOLUNTEERS of all ages have been combing the sands for debris for many months and there is still lots of trash to be removed. The debris fouls the sands and endangers aquatic wildlife," says Justin Rudd, grassroots founder/organizer of the 30-Minute Beach Cleanup. "We are looking for families, students, individuals and organizations to come out and support the effort to help make Long Beach's beaches clean and beautiful." The Long Beach chapter of the Surfrider Foundation is instrumental in helping with the 30-Minute Beach Cleanup each month. Surfrider sends a volunteer or two each month to assist with the cleanup and to distribute pamphlets about environmental projects. International Coastal Cleanup, based in Washington, has organized annual worldwide beach cleanups since 1986; this year's was on Sept. 18. Its volunteers work in teams, with one logging each type of trash. On its 2003 "entangling debris" list, balloon strings and ribbons accounted for 8 percent of the animals strangled. That is far behind fishing line and nets, which accounted for 60 percent, but at least fishing equipment has an excuse for being in the ocean and is not released just for fun. g Who's Behind this Environmental Initiative? JUSTIN RUDD, a 49-year-old Belmont Heights resident, is the grassroots organizer of the monthly 30-Minute Beach Cleanup. "The beach should be a place to go to experience Mother Nature's beauty, not LA's trash," says Rudd, who moved to Long Beach in 1997. Since the inception of the 30-Minute Beach Cleanup in June 1999, Rudd has organized more than 20,000 participants who have collected thousands of bags of debris, including glass, Styrofoam, various packaging materials and thousands of cigarette butts. RUDD WAS the recipient of Keep California Beautiful's 2004 "Environmental Volunteer of the Year" award. He has also been honored by the City of Long Beach; the Long Beach City Council; Surfrider Foundation; Long Beach Dept. 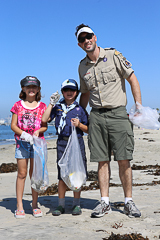 of Parks, Recreation & Marine; the California Junior Chamber of Commerce; and twice by The Aquarium of the Pacific for his leadership with the 30-Minute Beach Cleanup. "I want the sand to be clean and safe, and getting our city's people involved will make it happen," says Rudd. Long Beach is California’s fifth largest city and one of the leading regions for business, tourism and community in the west. Because it is a shoreline city, Long Beach also has a perpetual problem – debris on its beaches. NEAR DOWNTOWN, the Los Angeles River empties trash generated by upstream communities, which collects inside the breakwater and then drifts on shore. The San Gabriel River empties on the south end of the City, carrying trash that also drifts on shore. Rainstorms exacerbate this problem, sometimes dumping tons of debris on Long Beach beaches. The Long Beach Parks, Recreation and Marine Department is responsible for maintaining a clean and healthy shoreline. The Department provides daily litter and debris abatement (mechanized sand raking) for each of the City’s beaches. This sand raking is effective in removing large items of debris, but smaller items and pieces of trash (e.g. beverage containers, plastic cups and bottle caps, plastic and paper bags, cigarette butts) remain. Since 1999, the City of Long Beach has been the beneficiary of an extraordinary grassroots effort to educate and enable residents to become environmental stewards of its beaches. Justin Rudd, a Belmont Shore resident and grassroots organizer, is the driving force behind this successful environmental initiative. In June 1999, Justin created the 30-Minute Beach Cleanup. To date, he has organized more than 250 beach cleanups, and coordinated more than 20,000 volunteers who have collected thousands of bags of debris, including glass, plastic, Styrofoam, packaging materials and countless cigarette butts. Volunteers of all ages (individuals, families, students and organizations) have participated in the beach cleanups -- a dedicated and remarkable effort to help make the City’s beaches clean, beautiful and safe for residents, visitors, and marine animals, too! After five successful years, the 30-Minute Beach Cleanup stands as a role model for community involvement and improvement. Volunteers are provided with bags, gloves, and there are a limited number of free parking passes. Every month, refreshments are provided by Duthie Power Services and other corporate sponsors, and door prizes are donated by Long Beach businesses. Justin Rudd is a very accomplished grassroots organizer. He has created a community-based program that provides a much-needed service (beach cleanups and fostering environmental stewardship for the City’s residents). He has built and maintained solid partnerships with the City of Long Beach (City Council and City departments), local businesses, the Long Beach Unified School District, local colleges and universities, and local environmental, community service and church organizations. The 30-Minute Beach Cleanup is a “no cost” program. All personnel are volunteers (including Justin Rudd ), and all volunteer supplies (bags and gloves) are provided free-of-charge by the City of Long Beach, Corner Bakery, and other sponsors. All volunteer incentives (T-shirts, refreshments and door prizes) are donated by local businesses, and the City of Long Beach provides free parking passes for all volunteers. Print ad space in the community newspapers is donated (Gazette newspapers providing public service announcements). Justin Rudd is a firm believer in the collective power of concerned and aware individuals. His commitment and tireless efforts have created an important complement to the City’s maintenance of its beaches. As all California cities are grappling with the challenges of budget shortfalls, the 30-Minute Beach Cleanup offers a unique community improvement model that can be developed and sustained with minimal financial impact. Next on the horizon for the 30-Minute Beach Cleanup? A campaign partnering with regional organizations to create awareness of inland watershed issues and the importance of stopping litter before it gets into the Los Angeles and San Gabriel Rivers. $500 up for grabs - that's up to five $20 winners! This is the 5th year for the contest that will take place at Rosie's Dog Beach on Saturday, May 19 at 10:45 a.m. right after the beach cleanup and mustache contest. Hosted by Justin Rudd's Haute Dogs and 30-Minute Beach Cleanup. The poetry contest starts about 10:45 a.m. at the orange cones of Rosie's Dog Beach, closest to the Granada Boat Launch Ramp. Dogs are welcome at the monthly beach cleanups within the orange-coned area. Five winners will get $50 cash, but prize money doubles for each poet signed-in by 10 a.m., sharp, on the concrete boat launch ramp at 1 Granada Ave. and who helps clean the beach for 30 minutes. There will be five $50 prizes, and if winners are signed-in and help with the cleanup as outlined, they will get $100 each. Beachfront parking at 1 Granada Ave. is free (starting at 9:35 a.m.) for beach cleanup volunteers (and refreshments and door prizes are provided for them). HALLOWEEN COSTUME CONTEST for kid, teen and adult volunteers on the boat launch ramp at 1 Granada Ave. following the 30-Minute Beach Cleanup on Sat., Oct. 15. Contest begins about 10:35 a.m. Cash prizes will be awarded. Be signed in by 10 a.m.
LONG BEACH POLAR SPLASH is Saturday, Jan. 20, 2018, 10:40 a.m. at 1 Granada Ave. right after the 30-Minute Beach Cleanup. Will you join us when we jump into the chilly Pacific? Charities Win When You Jump In! On Sat., June 16, 2018, after the cleanup, stay for the 7th annual $1,000 Southern California National Anthem Sing-Off. To enter our contest, come to the cleanup at 1 Granada Ave. at 10 a.m. and stay for the 10:35 a.m. contest. All ages welcome. Details below. Small groups and soloists welcome. All must sing a cappella. Free entry. Microphone provided. Then, a few finalists will be asked to sing the entire first verse of the song. Please have the words memorized. If you can enter, please RSVP to Justin@JustinRudd.com. Winner will get a $1,000 appearance contract to sing at 20 upcoming Long Beach events. Winner will accrue $50 for each performance at a CAT event. See all CAT events at www.JustinRudd.com/cat.html. On June 16, 2018, Justin Rudd and the 30-Minute Beach Cleanup volunteers will celebrate their 19th year of consecutive monthly beach cleanups -- which Justin began June 1999! 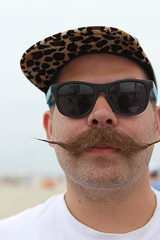 SoCal Mustache & Beard Championship at the Nov. 17 Beach Cleanup. Cash prizes! THE SOUTHERN CALIFORNIA MUSTACHE & BEARD CHAMPIONSHIPwill award $50 and $20 cash prizes following the beach cleanup on Saturday, Nov. 17. Free to enter. 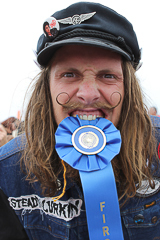 We do want contestants to take part in the 30-Minute Beach Cleanup from 10-10:30 a.m.
Got a handlebar? A cactus? A ringmaster? Or, is it a pencil line, a Fu Manchu, a tooth brusher or a wooly mammoth? Whatever you’ve got, wax it up and come on down! It’s going to get pretty hairy at this mustache bash! All ages/genders welcome. Free to enter and spectate. Prize money courtesy of the Long Beach Turkey Trot. What Happens at the Long Beach Polar Splash after the beach cleanup on Jan. 19? With 64 degrees under cloudy skies and 57-degree water, about 150 braved the first Long Beach Polar Splash in Jan. We'll do it again on third Saturday of Jan., following the 30-Minute Beach Cleanup. The cleanup and Polar Splash will be near 1 Granada Ave., next to Rosie's Dog Beach. Justin Rudd's nonprofit Community Action Team (CAT) will be donating $5 to various area charities (pre-registered groups of 15 or more) for every person that participates in the 10 a.m. cleanup and then plunges into the Pacific at 10:45 a.m., up to $2,000. Basically, on the word "go" from the organizers, the group of people will scamper into the water to submerse themselves, and then make a quick retreat. The whole process happens within minutes or seconds. Bring your cameras to document the fun, and post your photos on social media. To participate in the cleanup and poetry contest, arrive 9:35 - 10 a.m.
- poetry must be original and start with the words "Roses are Red..."
- Age and grade level (if any) will be taken into consideration by judges. - Awards include $20 bills. To participate in the monthly 30-Minute Beach Cleanup and the Haute Dog Poetry Contest, arrive 9:35 - 10 a.m. Cash prizes!